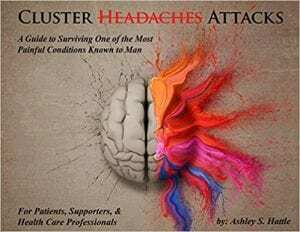 I had the opportunity to sit down with author, Ashley Hattle who just wrote the book, Cluster Headaches: A Guide to Surviving One of the Most Painful Conditions Known to Man. Ashley has cluster headaches and I have migraine attacks. Neither of us truly know what the other person goes through, yet we found so many similarities. In the end all headache disease communities need to unite and support each other. you have to honor mine. It’s that simple. It’s not a contest and we should always create a judgment free space! If you don’t experience cluster headaches or have been newly diagnosed, this is a great guide to understanding this disease. You can buy Ashley’s book on Amazon. Follow her on Facebook @Ashley S. Hattle – Author, Writer & Photographer. Ashley also hosts a monthly Twitter Chat called #CHTalk. Her Twitter handle is @ashleyhattle. Her website can be found here. Four-inch heels, power suits, cocktail dresses, regular hair and nail maintenance and appropriate make-up. That was me in the professional world. Client meetings, networking events and charity functions. They all require the professional look. ©2019 Golden Graine. All Rights Reserved.